D.A.M. I love a good magazine. Especially one that features my by-line. D.A.M. Magazine (Dynamically Active Movements) is an online magazine that features profiles and blogs on music, fashion, the arts and everything in between. This month the online mag features my captivating interview with Madison, Wisconsin based indie/folk/alternative music artist- Curt Mychael. I caught up with him while he was in studio working on his second much-anticipated album. Oh and there’s also a cover story and interview with Chilli from the world-renowned group TLC in there too. By the way, did I mention MY article? Curt Mychael. Just a reminder. The fine publishers at D.A.M. Magazine came to the agreement that I must be a part of their team and offered me the position of Music Editor. I’d like to congratulate the intelligent crew at D.A.M. Magazine for their great decision making skills. I humbly accept. The extraordinary and insightful people at D.A.M. Magazine have taken my text article and turned it into graphical gold. Paul McCartney, Jason Mraz, The Archies, Nick Drake. Curt Mychael, an up and coming singer/songwriter from Madison, Wisconsin, has had comparisons to them all. His highly infectious, well-written, upbeat tunes have been slowly making their way past the myspace crowd and into the mainstream. We caught up with the talented artist in the studio where he’s currently working on his 2nd –yet to be titled album expected to be released in the summer of 2010. 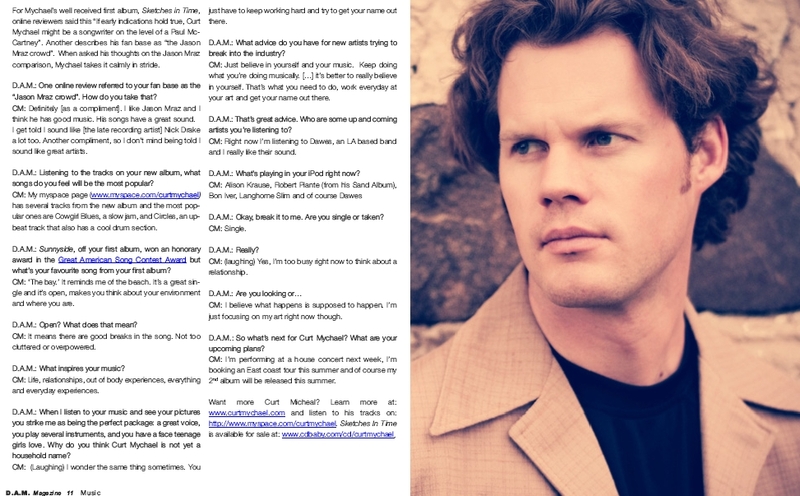 Between writing songs, recording tracks, performing all over Wisconsin, and booking shows for his upcoming east coast tour, Mychael generously took a break from his long day to answer a few questions for D.A.M. Magazine. The interview is also available on the D.A.M website here. Budget Life: Math time! Add up all the money you spend in a month on the fun stuff, cut it by over 60% and then try to live off the rest. Can you reach the end of the month before you reach the end of the money? The $10 Dinner Party: Serving a party of 7 on a $10 budget. Macaroni and cheese not allowed… Darn it. What in the world? : Sometimes I attend events that can go really, really well…or the complete opposite. Either way it makes for a great story. Bye-Bye Mustard: Pineapple slices; chutney; alfalfa sprouts; cranberry sauce; butter chicken sauce; bacon wrapped and deep-fried. Creative and delicious(?) ways the old fashioned hot dog is being revamped. Get D.A.M. in your life. Check them out online. 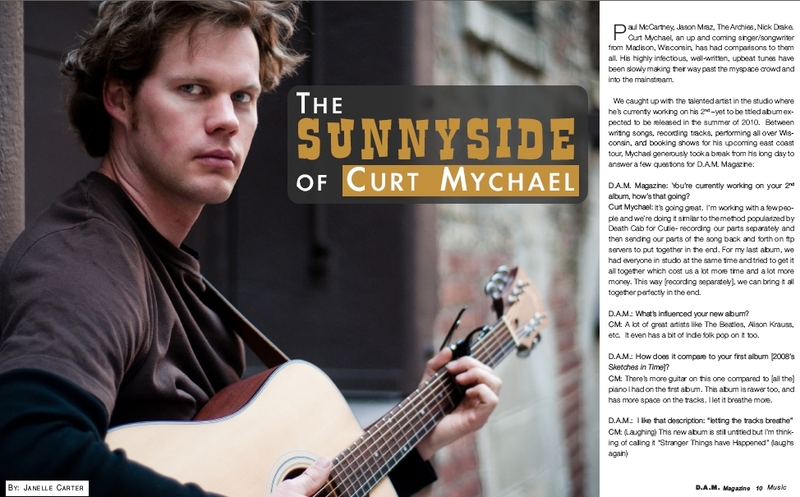 Go to Curt Mychael’s myspace page to listen to tracks from his upcoming album as well as his #1 track, ‘Sunnyside’, off his first album. Want to recommend an artist (Fashion, Music and/or the Arts) for D.A.M. Magazine? Send the info to NelleyTimes@gmail.com and they may be featured in an upcoming issue.